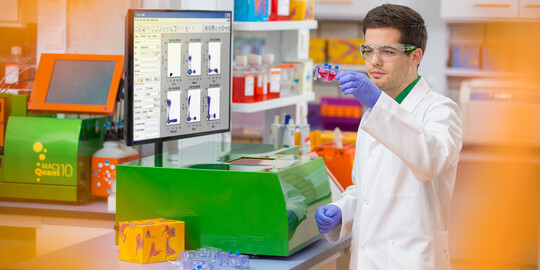 Microchip-based cell sorting on the MACSQuant Tyto Sorter happens in a disposable and fully closed cartridge system, making it completely safe for the operator. It also means high sort purities without the risk of sample-to-sample cross-contamination and extensive cleaning procedures in between. Download our scientific poster and find out more about microchip-based sorting of high-risk material such as bacteria, yeast, and parasites in a disposable and fully closed cartridge system. Are you interested in sorting high-risk material in your lab? Get in touch with our experts to find out more!